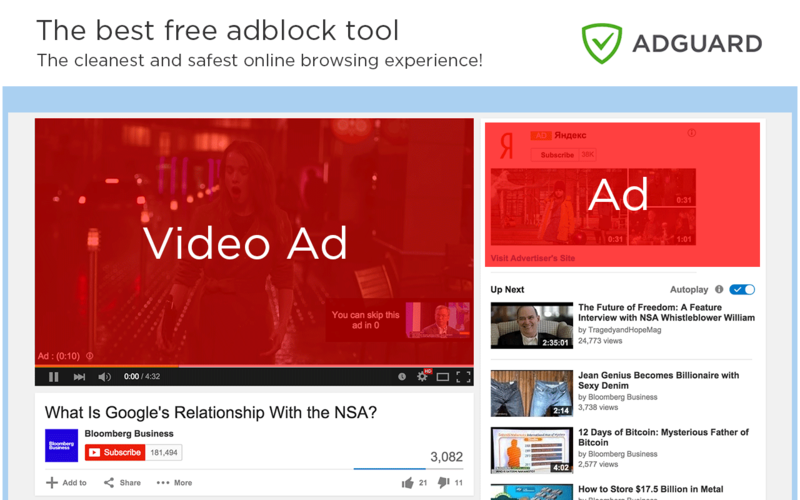 Adguard is the fastest and lightweight ad blocking extension for browser. * Blocks all ads including video ads (including Youtube video ads), rich media advertising like video ads, interstitial ads and floating ads, unwanted pop-ups, banners and text ads (including Facebook advertisements). * Speeds up page loading and saves bandwidth, thanks to the missing ads and pop up windows. * Blocks many spyware, adware and dialer installers (optional). * Protects your privacy by blocking common third-party tracking systems (optional). * Protects you from malware and phishing (optional).